While I am still in L.A. at the moment, I am just feeling too impatient to wait until I return to Boston to tell you about a simple, yet satisfying dessert I made last weekend. Perhaps when you hear more about it, you will understand why I feel this way, and hopefully, you will forgive me for rushing it. Really, there are things that cannot wait. In fact, I cannot remember when I had prepared crème brûlée for the last time before last Saturday. This is actually pretty surprising for someone like me who is so fond of this traditional French dessert. And so, I love when friends come over for dinner, giving me an excuse to try and prepare foods that I have not cooked in a long time. Isn’t it the best gift that you can receive? Rediscover foods and share them with your favorite people. When our friends J.F. and Lauren arrived last Saturday night, I had planned for a simple, rustic-style dinner: a blanquette de veau I cooked for a few hours to have as-tender-as-you-can-get meat, a large bowl of forbidden rice — which J.F. discovered and ate for the first time — a selection of colorful root vegetables cooked with fresh herbs and a salade verte (green salad). A platter full of French and Italian cheese followed — Taleggio disappeared in less than a minute. These dinners à la bonne franquette remain amongst my favorites; they do not require hours of planning, but offer comforting food that everyone enjoys. But of course, I had to keep the best for the end. Because I simply had to. It was not complicated. It was far from being over-the-top. And it made four people happy and content. Us! I decided to make lavender crème brûlée with fresh berries, and since P. had begged me — yes, he really did — for chocolate cookies the day before, I also had a large plate of chocolate and walnut cookies (gluten-free too, as I experimented with using quinoa, amaranth and sorghum flours together: the cookies turned out light and delicious. I often order crème brûlée in restaurants. Yes, boring, I know, but I like this dessert that much. Do you know anyone who dislikes crème brûlée? Moi ? Jamais (never). How could you resist a spoonful of velvety creamy perfection slowly disappearing in your mouth, calling for a second one right away? Of course, it is sometimes the simple things that become the hardest to master. And so, while I am yet still not the queen of using the torch, I hope to have many more opportunities to practice. A very good plan, non ? I will never get tired of tasting a smooth crème brûlée. Especially when it is shared with friends, à la bonne franquette. 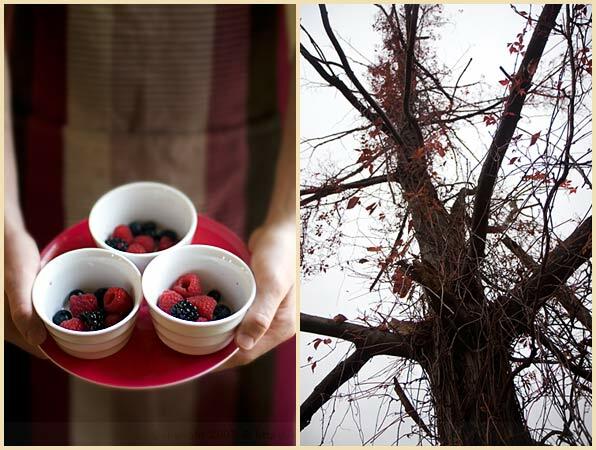 Divide washed berries between your ramekins, and place the ramekins in a large baking dish. Bring the cream to a gentle boil and stop immediately. Add the lavender, cover and let infuse for 15 min. In the meantime, mix together the egg yolks with the sugar and vanilla until light in color. Pour the cream slowly and mix. Divide the cream between the ramekins. Fill the baking dish with boiling water so that the water line is half way up to the height of the ramekins. Bake in the oven for 25 to 30 min. Let cool before placing the creams in the fridge for a few hours. When ready to serve, sprinkle with extra fine sugar and caramelize with a torch, or under the broil for a few minutes until caramelized. Serve with extra berries. Divisez vos fruits au fond des ramequins et placez les ramequins dans un grand plat à gratin. Faites chauffer la crème jusqu’à la première ébullition. Arrêtez de suite. Ajoutez la lavande, couvrez et laissez infuser pendant 15 min. Filtrez. Pendant ce temps, mélangez les jaunes d’oeuf avec le sucre et la vanille jusqu’à blanchiment. Versez doucement la crème, et mélangez bien. Divisez la crème entre les ramequins. Remplissez le plat à gratin avec de l’eau chaude, jusqu’à mi-hauteur. Faites cuire dans ce bain-marie pendant environ 25 à 30 min. Laisse refroidir avant de placer les crèmes au frigo pendant quelques heures. Au moment de servir, saupoudrez-les de sucre fin et faites caraméliser avec une torche ou sous le gril du four pendant quelques minutes jusqu’à caramélisation. I would love to hear more about the gluten free cookies! We just discovered that my son is allergic to wheat and gluten and I’m starting to dip my toes into the world of gluten free baking. Je crois que j’aime la creme brulee au moins autant que toi, cette petite couche de caramel craquante et la creme fondante au dessous, je n’y resiste pas. Quelquefois les plaisirs les plus simples sont les meilleurs. love creme brulee! this looks divine! The little heart holders are so perfect. Ces crèmes brulées sont fabuleuses! So cute! I’m always blown away by both your fantastic recipes and your stunning photography. You have an amazing gift! 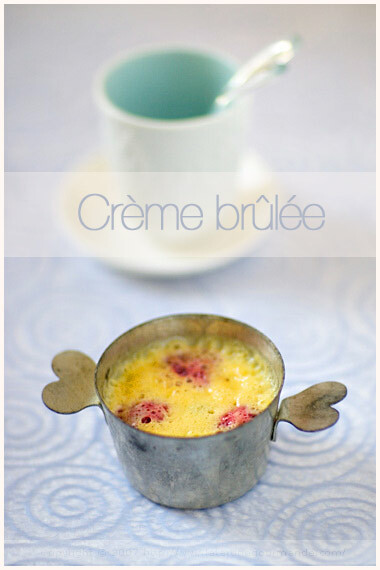 Cute creme brulees! I usually let the hubby do the torching. The creme brulee sounds (and looks) delicious. I’m interested in the gluten free cookies, too, since my mother has celiac disease and I’m always looking for new and delicious GF recipes to pass along! Wow, this looks fantastic. I have been wanting to make something with lavender and I think this will have to be top on the list. You’re right. Everyone loves creme bruless. My wife orders it for dessert every time we go out. She just loves it. A la bonne franquette à la bonne franquette ça c’est toi qui le dit !!! 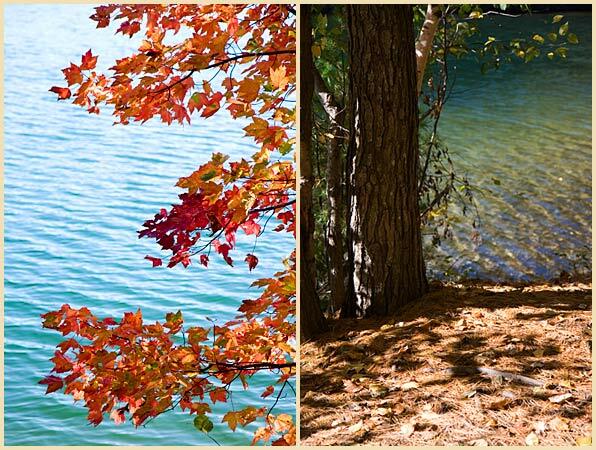 Walden Pond! I was there last year beginning Nov.! Miam miam tes crèmes brûlées… Toujours aussi belles les photos. Merci de nous régaler! J’adore le petit moule avec les poignets en coeur… J’en ai acheté le même dans le 4è …. Lovely creme brulee….and I agree with you. You can never get tired of it! Looks delicious! Have you tried creme brulee with rhubarb compote underneath? It’s been a long time since I have had creme brulee…must remedy that soon! I love your little tin with the heart handles…adorable! Bea, these are absolutely gorgeous, and I love that tiny little metal ramekin so much, how adorable! Bea, can I have one, please? Moi aussi, c’est un de mes desserts préféré, mais j’oublie d’en faire. Jolies images, comme d’hab. Merci. A couple of weeks ago, we visited a lavender farm. I still have some culinary lavender left. Last week, a cute traditional crème brûlée dish set at Arthur Quentin caught my eyes. If you keep doing great recipes like this, I would not have a choice but to surrender. Note: If you ever come to Montreal, visiting this French Country tableware store would be a treat. Berries and lavender sound divine! One of your people asked about culinary lavender and I couldn’t resist adding a comment here. I’ve got a lavender farm in NW Washington State and we make a culinary lavender from our crop. In general, most lavenders we see here in the USA are potential cooking lavenders with the exception of Lavendula Stoechas (which isn’t good for you to eat). But, some people are rather fierce about which they prefer in their cooking. Some varieties are more often mentioned than others – for instance, Carolyn Shipley who wrote the fabulous “Cooking with Lavender” book used only Provence Lavender (a hybrid probably created in Canada, but it’s a nice name). What I’m coming to realize is that it’s also a function of “La Terroire” which is about where the lavender is grown, and who grows it and uses it. Here we make a blend of Provence and a variety of Lavendula Angustifolia to make our Culinary Lavender. What also makes it “culinary” is that it is VERY clean. We grind ours up because it disperses better in recipes, but others like it whole so it gives a big burst of lavender flavor. Alors, il faut voyager et cuisiner avec beaucoup de différentes sortes des lavandes – C’est magnifique, non? I just can’t stop looking through your photos…each is more divine than the next. Everything is always just right…the light, the food, and the dish. 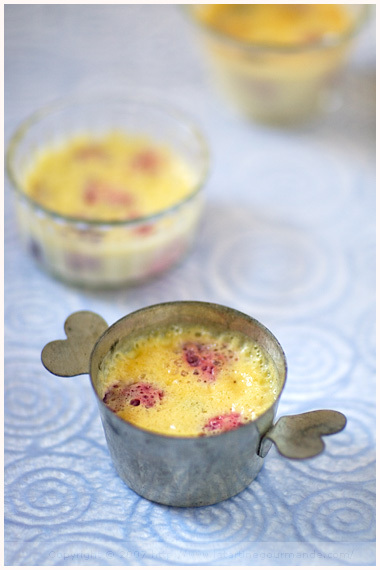 I love the heart mold used for the Creme Brulee…it’s so very sweet. 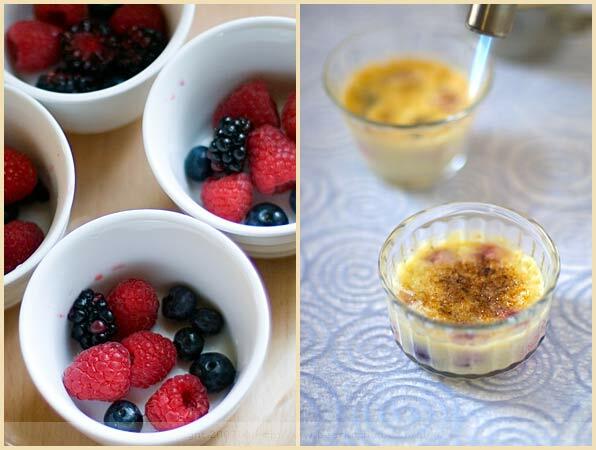 My Mother used to make crème brûlée all of the time, and they were absolutely fantastic, and I couldn’t get enough — until I did in fact eventually get enough. Neither she nor I have made it in a long time though. These look so pretty, and sound so delicious! Thanks very much all for your comments. And thank you Sarah for giving precious information about culinary lavender. I am learning a ton here! This IS my favorite dessert of all time! I am very fortunate to have a son who is a chef and all I have to do, being a mom, is ask. Satisfying pleasure! Your photos are lovely:) Cheers! 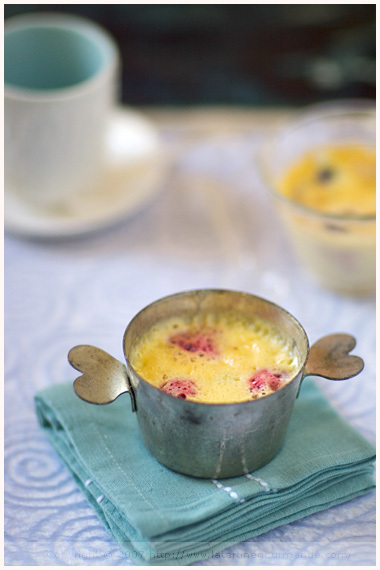 I love the metal ramekin…so cute. Lovely capture of creme brulee. Si c’est à la bonne franquette, alors … on choisit même d’en manger une deuxième ! La première page d’un livre de cuisine?^^Si beau. Si bon. I came across your web site via Flickr.com. I must say I tried creme brulee for the first time recently and as you stated I too am not the master of the torch, but it turned out wonderfully! It was an espresso creme brulee ad wanted to ask you if regualr granulated sugar is best for browning or should I use cassonade? I studied french cuisine and do this for a living but am always open to new tips. Merci et Bon Appetit!! This was awesome. Thanks for the recipe.